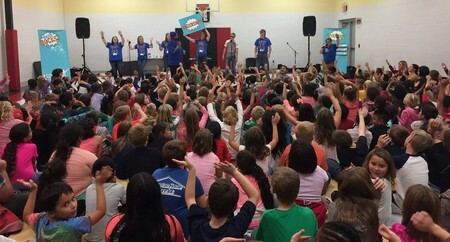 School Assemblies — Water Rocks! Water Rocks! 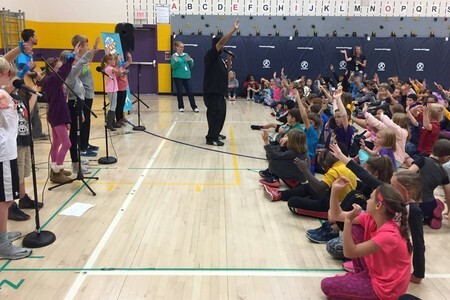 helps students, teachers and parents learn the science of water quality through music with our rockin' Assemblies. Our Assemblies are developed to touch the hearts and minds of youth, teachers and parents using music, plays and total participation. WR! Assemblies educate, challenge, and inspire young people towards a greater appreciation of our water resources. Who are the Water Rocks! Assemblies for? WR! Assemblies directs attention towards the K-8th grades and engages high school students as peer mentors. How does the Water Rocks! School Assembly fit in with the Next Generation Science Standards? Check out our Next Generation Science Standards page to see how the Water Rocks! School Assembly has been aligned with the new standards. What is the cost of Water Rocks! Assembly programs? There is a $350 fee for Water Rocks! Assemblies, which covers pre-event coordination, the interactive school Assembly program(s), and costs of the follow-up materials distributed to teachers. How do I book a WR! Assembly? Ready to schedule a Water Rocks! Assembly at your school? Contact Todd Stevens, Music and Outreach Specialist, at 515.294.2473 for WR! Assembly booking! What do principals and teachers have to say? Principals, teachers, and students think Water Rocks! Assemblies are rockin'! Check out our Testimonials page to hear what past Water Rocks! Assembly participants have to say.